Toronto – May 30, 2018 – UFCW Canada recently joined our national partner, the Egale Canada Human Rights Trust, for its first-ever Identity Conference on LGBTQI2S issues. Toronto – May 24, 2018 – Once again, UFCW activists across the country are preparing for another fun and colourful Pride season. Toronto – May 11, 2018 – Across the globe, May 17 is recognized annually as the International Day against Homophobia, Transphobia, and Biphobia – a day to speak out against LGBTQI2S discrimination. 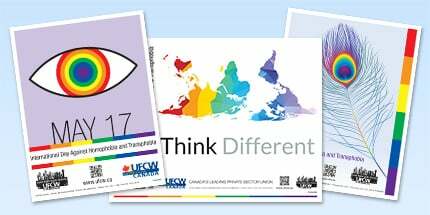 Toronto – December 13, 2017 – OUTreach, the UFCW constituency group for Lesbian, Gay, Bisexual, Transgender, Queer, Intersex, and Two-Spirited (LGBTQI2S) members, has released a new workplace resource aimed at raising awareness of issues that LGBTQ12S workers commonly face on the job. Toronto – November 16, 2017 – On the Transgender Day of Remembrance, November 20, we acknowledge and remember those who have lost their lives due to transphobia and hate. Washington, D.C. – November 9, 2017 – OUTreach, the UFCW constituency group for LGBTQI2S and allies, is offering four scholarships for UFCW members to attend the 2018 Creating Change Conference in Washington, D.C., scheduled for January 24 – 28, 2018.